Much improved working with the phases of the wind shifts kept us in the game today but a poor downwind leg left us well back in the fleet . While Hanni and Foreign Affairs were enjoying a large break on the fleet we were mixing it with Allegro, Amanti and Joli and enjoying a very pleasant afternoon on the water. At the finish we were as close to a dead heat with Joli as is possible and we must have beaten then across the line by half the length of our bowsprit. At least that is the way the finishers saw it and we will take it. We both almost caught Amanti but it was too much to expect to sail through the lee of two yacht on a beam reach to the finish line. The day started well with the sea breeze arriving well before start time and in a direction almost straight down the course. Shifts were moving the favoured end around and we picked the wrong end. It was a bit disappointing to see The Biz at the the pin start on Port and cross the fleet while we were most windward and in dirty air. 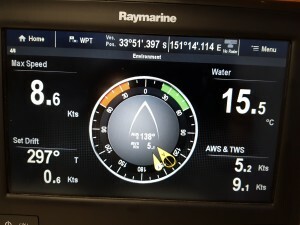 We sailed on untill all the fleet had tacked away and were rewarded with a nice shift to the left so we could come back on port tack and have all the early tackers below. The exception was Hanni who was already a minute out in front and sailing away. 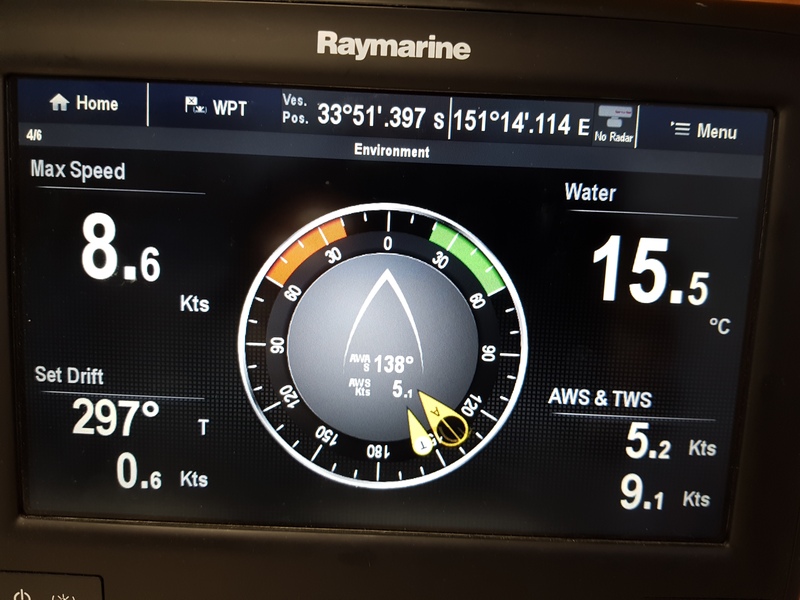 We played the shifts well except for one when we tacked under a port tacker to get back across while Allegro kept going north and came back with a minute gain. We kept a good eye on Joli and swapped tacks a few times, sometimes on the right side of the shifts and sometimes not. On the run back we went inshore because we were being hunted down by a casual entrant and that cost us dearly. Out further there was stronger wind and stronger tide. Here Amanti, and Joli passed us and Allegro and the front runners pulled away. In Rose bay we could not break the overlap from Silky and had to go wide of the mark. Fortunately the fleet went high and with Silky in front we had to go low which on this occassion allowed us to catch up to Allegro and Amanti as well as slip through Joli. 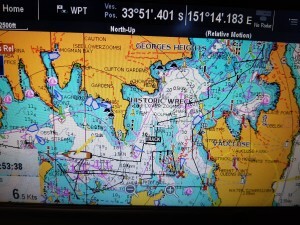 As we rounded Point Piper we passed Amanti who had decided to tack away from Allegro’s dirty air. I would have toughed it out in Allegro’s dirty air as she was going in the right direction but we tacked away for clear air and in two tacks lost another minute with Amante and Joli coming back at us. There was just the run and reach home in very quiet air and despite going as low as we could we could not break through the lee of Joli nor catch Amanti and only a light patch just metres away from the finish line enabled us to put our bowsprit in front of Joli. Allegro, Passion X and Joli all scored discards today and of the top five Hitchhike shoots to the lead from Joli, Allegro and Trim with Passion X drifting backwards to fifth. Still we live to fight another day and our collective poor handicap showing won’t hurt our handicaps. Really nice tacking angles against a strong incoming tide were not enough on the day. I got excited about this maximum boat speed for the day until I realised it was when we were under motor.